The Disney Wedding Pavilion at Walt Disney World in Orlando, Florida was the sight of a picturesque October afternoon wedding between Kyle and Julia. It was a dream wedding as they were surrounded by about 40 of their closest friends and family members for their early fall wedding. 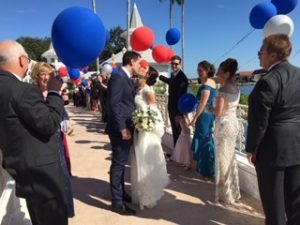 The Las Vegas couple had dreamed about getting married at Disney and their dreams finally came true with a beautiful custom ceremony. Rev. Jeff Thompson of Sensational Ceremonies worked alongside the couple to build their custom ceremony to fit their beautiful love story and to showcase their sweet love for their family and friends. With amazing floral arrangements lining the aisle by the Walt Disney World florist the couple took their place in the from of the Walt Disney World Wedding Pavilion to recite their vows, exchange wedding rings, and become husband and wife. Many thanks to Disney Fairytale Wedding for making Kyle and Julia’s dreams come true. Congratulations Kyle and Julia, may you live happily ever after!